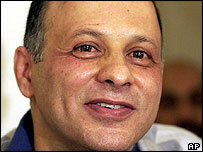 Iran's most prominent dissident journalist Akbar Ganji has been freed from jail after five years. 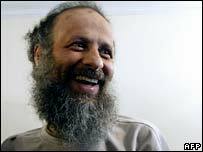 Ganji was jailed in 2001 for writing articles in which he linked senior officials to the murder of dissidents. Correspondents say he is a hero to Iran's reformists for standing up to hardliners, and many world leaders have called for his release. He has spent much of his jail term in solitary confinement and went on hunger strike for several months last year. When brought to court to stand trial, Ganji complained he had been beaten but he says he was then threatened for revealing it. The BBC's Frances Harrison in Tehran says many Iranians thought Ganji, 46, would never be freed from jail, even though his sentence was due to end. The release comes days before the United Nations Security Council is due to discuss Iran's stand-off with Western nations over the country's nuclear programme. He is so outspoken in challenging the regime that they assumed fresh allegations would be levelled against him, she says. But Ganji's wife and lawyer confirmed he was sent home on Friday night, with no other pending charges against him. The family says he is not in good health. He has low blood pressure and they say he now weighs only 49 kg, after having first been on a hunger strike and then later, they allege, denied regular food by the jail authorities. But one family member told AFP news agency he was "doing well and in good spirits" after his release. Ganji is not expected to give any interviews now because his wife says that might give the authorities an excuse to arrest him again. He came to prominence after his investigation of the 1998 murders of five dissidents by intelligence agents. The intelligence ministry said "rogue agents" had carried out the killings, but Ganji maintained senior officials were behind them.